A capacitor with an unknown capacity, a resistor with resistance 50 Omega; and a coil with inductance 0.10 H are connected in series in sn alternating circuit with frequency 50 Hz and amplitude of voltage 300 V. The ratio of amplitudes of the voltage in two parts of the circuit which are marked in the picture is Um1:Um2 = 1:2. Calculate the capacity of the capacitor and the amplitude of the current in the circuit. For the RLC circuit connected in series is true that the current which flows through each of the components of the circuit is the same. We can imagine the parts of the circuit with marked voltages as two separate circuits with a given total voltage. Currents which flow through these circuits are the same because it is a RLC circuit in series in fact. We have chosen two parts in the circuit in the picture from assigned task. We „know“ the amplitude of the voltage of each of them so we can solve each part as a separate circuit. We use Ohm’s law for an alternating circuit. The current is the same in both of the circuits, so we can formulate the capacity from the ratio of voltages. We gain the amplitude of current from Ohm’s law which we use for the whole circuit. 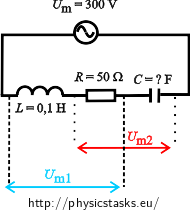 A coil with an inductance L and a resistor with resistance R are connected to the part of the circuit which belonges to voltage Um1. The coil and the resistor are connected in series. The amplitude of current Im is the same for both formulas so we can reduce it. We should express the amplitude of the current from Ohm’s law for the whole circuit. From the assignment we know the amplitude of the voltage of the power supply Um. There are all three segments in the circuit so we need all three quantities for the formula of impedance – resistance, capacitive reactance and inductive reactance. Capacity of the capacitor connected in series is approximately: C = 30 μF. Amplitude of the alternating current in the circuit is approximately: Im = 3.3 A.